A star-forming galaxy 12.8 billion light-years away offers insight into the early days of our universe after the Big Bang roughly 13.7 billion years ago. Astronomers have confirmed the discovery of one the oldest and most distant objects ever known in the universe — a star-forming galaxy 12.8 billion light-years away that started forming within a billion years of the Big Bang that kickstarted everything. The galaxy, known as G09 83808, was first spotted by the Herschel space telescope, but it only showed up as a blur. The astronomers who made the find wanted more information, so they relayed the data to a team that used the Large Millimeter Telescope, which hosts the largest steerable dish in the world atop the summit of Volcán Sierra Negra, in the Galapagos. With the 50-meter-diameter LMT dish, astronomers confirmed that G09 83808 is the oldest object ever found by that telescope. Only one other object — a similar galaxy that’s slightly older and more distant — has ever been found by other telescopes. The research was led by Jorge Zavala, then a graduate student working under LMT director David Hughes. (Hughes is now a postdoctoral research fellow at the University of Texas.) The results were published in the journal Nature Astronomy. G09 83808 provides almost unique insights into the early days of our universe after the cosmos was formed 13.7 billion years ago. "This new object is very close to being one of the first galaxies ever to form." "Seeing an object within the first billion years is remarkable because the universe was fully ionized, that is, it was too hot and too uniform to form anything for the first 400 million years," said Min Yun, an astrophysicist at the University of Massachusetts Amherst who participated in the research, in a statement. "So our best guess is that the first stars and galaxies and black holes all formed within the first half a billion to one billion years. This new object is very close to being one of the first galaxies ever to form." Objects such as G09 83808 are difficult to see because they are surrounded by gigantic dust clouds, keeping them out of view from observatories such as the Hubble Space Telescope, which best observes in visible and infrared wavelengths. The LMT is better positioned to look at objects of this kind because it uses millimeter-length wavelengths that can peer through obscuring dust. Gravitational lensing also helped the astronomers with observations. This phenomenon magnifies light as it passes by a large object, making more distant objects look larger. G09 83808 appeared 10 times brighter and closer than it actually is because there is a large galaxy in between the object and Earth, which helped magnify G09 83808 through gravitational lensing. LMT will be fully operational this winter and able to peer at more objects that are very old and have a high redshift. 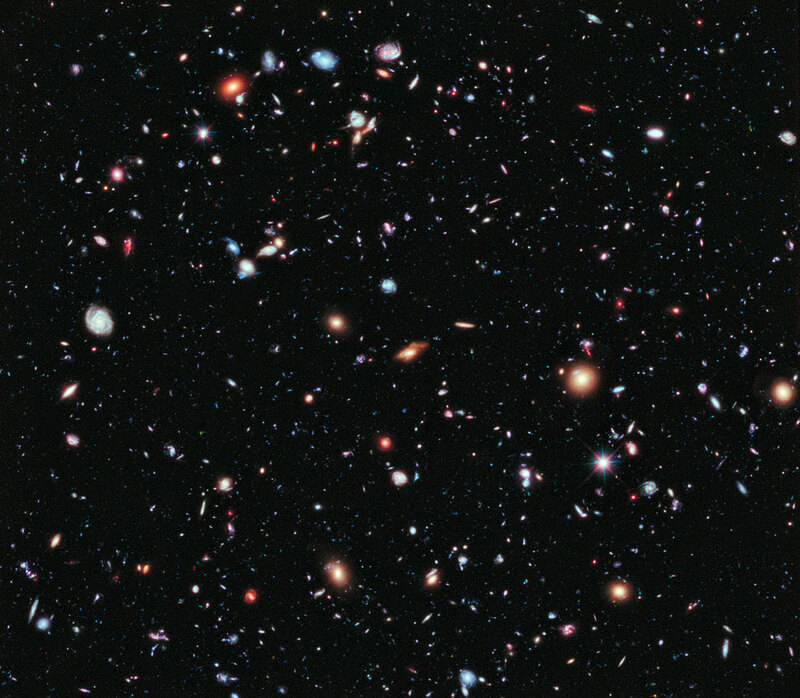 Redshift refers to the speed at which the universe expands. More distant objects have a larger redshift. The redshift of G09 83808 was confirmed through observations of the spectral lines of carbon monoxide, which were shifted into the red end of the spectrum. The redshift was independently corroborated with the Smithsonian Submillimeter Array on Mauna Kea, Hawaii, in association with astronomers at the Harvard-Smithsonian Center for Astrophysics.